Home › Home and Kitchen › Premium Class Stainless-Steel Kitchen 12 Knife-Set With Acrylic Stand - 8" Ch.. Premium Class Stainless-Steel Kitchen 12 Knife-Set With Acrylic Stand - 8" Ch..
Conservative blade thickness and elite design allow for easy handheld use. 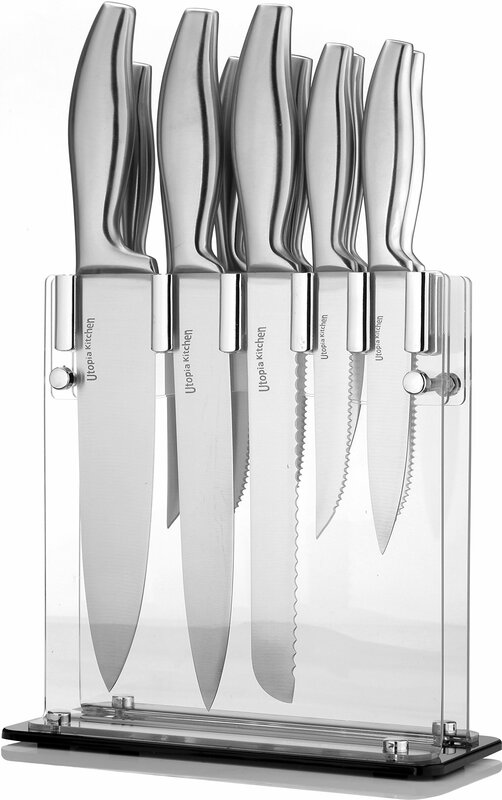 This 12 piece knife set includes: 8" Chef Knife 2.5 mm blade thickness 8" Bread Knife 2.5 mm blade thickness 8" Carving Knife 2.5 mm blade thickness 5" Utility Knife 2.5 mm blade thickness 5" Paring Knife 2 mm blade thickness 6 Pieces of 4.5" Steak Knives 2 mm blade thickness Acrylic Stand for convenient storing of the knives Top-Rated Kitchen Knives! For safe, durable, and quality blades that don't dull easily, our Knife lineis your ticket to cooking with ease. For food prep at home or in thecommercial restaurant kitchen, our 12-Piece Acrylic Block Knife Set offersyour home or business a complete set of kitchen knives and blades for all ofyour food prep needs. Easy-to-use and durable, this Stainless Steel knife setis made with tarnish-free and rust-resistant Stainless Steel that will staysharp through many uses. Set includes knives in the following styles: 100% Stainless Steel Blades 6-Piece Kitchen Knife Utility Set Comfortable grip for easy maneuvering Multiple Blade styles cut easily through a variety food items. Our Customer Satisfaction Money-Back Guarantee If you are not satisfied with our 6-Piece Block Knife Set, just return itwithin 30 days for a full refund.